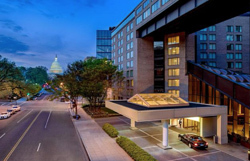 IAA is holding a limited number of guest rooms at the Army Navy Club for Adviser Advocacy Day attendees at a rate of $290.00 plus tax. If you would like to reserve a room at the Club, email Lisa Gillette at lisa.gillette@investmentadviser.org. Delta Airlines is offering Adviser Advocacy Day attendees 2-10% discount on airfare. Reservations and ticketing are available via www.delta.com/meeting. Select the “Book A Trip” tab. Enter NMQV2 in the Meeting Event Code box.